HEAVY DUTY FABRICATED DECK: The robust cutting deck features twin 11 gauge sheet (1/4 in. combined) construction for added structure and spindle support. Cast iron blade spindles, impact resistant discharge shields and reinforced scalp rollers add to the commercial duty design. 6-INCH WIDE CASTER WHEELS: Durable 6 in. wide front casters with pneumatic tires provide long life and are easy on turf. COMFORTABLE OPERATION: Convenient seat slide with spring suspension, large dampened steering levers with premium foam grip and multiple control lever adjustments for operator preference. 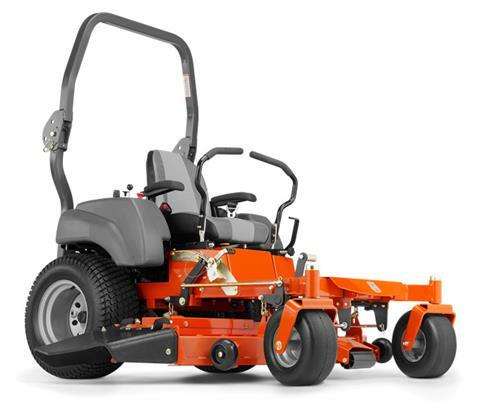 ENDURANCE COMMERCIAL ENGINE: Husqvarna's Endurance Commercial engines provide extended life with features like cyclonic air filtration, heavy duty starting systems, cooler running cylinder heads and improved crank support. ROPS Down - 45.5 in.